A comfortable accent piece inspired by heirloom European furniture, this modestly sized chair can squeeze into any space to add a pop of color to your existing room decor. The tightly upholstered seat sports resilient, stretch web suspension and fiber fill for a pleasant seat. Adding to the comfort is one, Lux Down kidney pillow. Comes standard in a tropical, striped fabric with orange flowered pillow, but customizable chair fabrics, wood finishes, and nailheads are also available on the customizable model. The Bali Hai San Carlos Chair with Exposed Wood Arms and Casters by Tommy Bahama Home at Hudson's Furniture in the Tampa, St Petersburg, Orlando, Ormond Beach & Sarasota Florida area. Product availability may vary. Contact us for the most current availability on this product. Fabric Options Over 1000 fabric styles and colors are available to choose from. On items where nailhead trim or pillows come standard, custom pillow fillings, trims, and nailhead finish colors are available with no additional charge. Frame Construction Hardwood frame from select laminated hardwood, reinforced with two fame center support rails that add strength and durability. All joints are double-doweled and glued, corners are reinforced with wood and cleat blocks for structural support. Maybe it was a tropical honeymoon, or a treasured vacation on an island with white sand beaches. You remember those destinations with a warm, happy glow every time. For those times when you can't leave home and hop on a plane, you can retreat to your favorite room and bask in the restful, lazy summertime feel of Bali Hai home decor. Furniture from the Bali Hai collection captures the essence of the tropical resort with a blend of British West Indies and Polynesian design. These pieces are rich with details like woven raffia, leather-wrapped bamboo and rattan, crushed bamboo and penn shell inlay. Homes in every part of the country can create a cozy retreat for the dining room, living room, guest or master bedroom, office, rec room or bar area with the myriad selection of pieces from Bali Hai. Special features of this group include a wide selection of customizable dining options, and tropical upholstered pieces for unwinding in comfort and style. At Tommy Bahama Home, we believe the cure for today's hectic pace lies in creating a lifestyle at home that evokes the essence of relaxed destination living. Our refined home furnishings feature unique natural materials, rich hand finishes, custom hardware and inviting upholstered seating in fresh island colors. 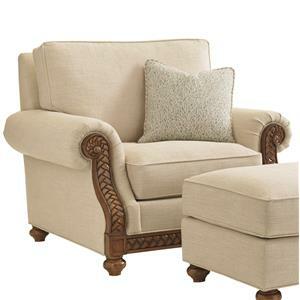 The Bali Hai collection is a great option if you are looking for Traditional furniture in the Tampa, St Petersburg, Orlando, Ormond Beach & Sarasota Florida area. 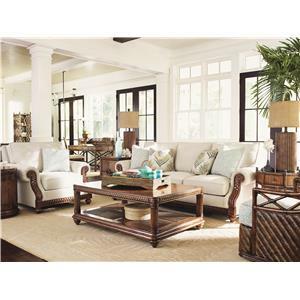 Browse other items in the Bali Hai collection from Hudson's Furniture in the Tampa, St Petersburg, Orlando, Ormond Beach & Sarasota Florida area.